As an SEI Partner, CMKL provides CERT information security courses that help organizations improve their software engineering capabilities and to prepare for, respond to, and recover from attacks. Recognize signs of attacks and learn how to gather information required to handle an incident. Analyze and assess the impact of computer security incidents. Detect various attacks, develop a strategy to handle major incidents, and execute cyber threat hunting goals. Show the knowledge and skills for career advancement, and helps organizations identify, hire, and promote motivated and skilled individuals in the workforce. Intended for computer security professionals with one or more years of experience in incident handling. Basic introduction to the main incident handling tasks and critical thinking skills that will help an incident handler perform their daily work. For computer security technical staff who have little or no incident handling experience. 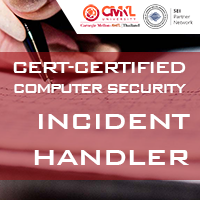 Building on the methods and tools discussed in the Fundamentals of Incident Handling course, this CERT incident handling course adds additional expertise for understanding incident handling and related practices and functions. By focusing on operational risks to information assets, The OCTAVE Allegro approach helps participants learn to view risk assessment in the context of the organization's strategic objectives and risk tolerances.